Edward Hopper (1882-1967) represents arguably the zenith of 20th century American Realism. After training with Robert Henri (1869-1929) at the New York School of Art, Hopper worked primarily as a commercial illustrator for the first half of his life. In fact, although Hopper readily sold a variety of prints and watercolors on the side, he did not achieve his first artistic success until he was forty-three. At the Rehn Gallery in 1924, Hopper's solo show sold every work in the gallery; this was followed by his personal watershed painting, The House by the Railroad, in 1925. From that point on, Edward Hopper would be defined by his use of light, isolation, and implied narrative in composition. Hopper's dramatic impact was such that Hitchcock would later use The House by the Railroad as the basis for the Bates Motel in Psycho. The painting at the right, Nighthawks, is Hopper's most famous work. On display at the Art Institute of Chicago, Nighthawks is an oil and canvas work that represents Hopper at his most iconicand most popular. This 1942 work epitomizes Hopper as a painter of loneliness and existential solitude, rendered as the contrast between the mute colors of night and the harsh fluorescent glare of the diner lights. Hopper often drew on his immediate surroundings for inspiration, most notably New York City and Cape Cod. Nighthawks is drawn, in Hopper's words from "a restaurant on New York's Greenwich Avenue where two streets meet." Though the building that inspired him no longer exists, the evocative, transcendental diner that he depicted endures. At first glance, as with many of Hopper's works, it might be easy to dismiss the subject as mundane. However, the trademark tension between light and shadow immediately draws the eyes in the composition. In this, Hopper reflects a painter's sense of film noir, particularly in his urban subjects. 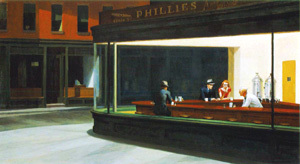 Equally distinctive in Nighthawks is the distance Hopper places, both literally and figuratively, between the viewer and the four subjects framed within the diner. Although Hopper's interests lay much more in the play of light than in human subjects, the intentionally ambiguous scene created by the interactionor lack thereofbetween the characters is rich in narrative possibilities. The undercurrent of desperation that makes the work so intriguing is subtly reinforced by the artist in a number of ways. Note that the selective angle chosen for the point of view precludes the entryway; these four human beings drawn together by happenstance seem trapped within the glass walls, specimens for our imaginations. The couple in the background hunch over the cherry wood counter, their faces tired and gaunt. The woman examines her nails, seemingly oblivious to the man sitting next to her. The man in the foreground sits apart from the rest, a mystery with his back turned and partially obscured from the light. And linking them, the soda jerk who seems trapped within the confines of the counter, eyeing the customers with perhaps a hint of suspicion. The time of night, the fluorescent glare, and the posturing all create a bleak, almost menacing solitude. Even the title, Nighthawks, carries tension with it. Hopper combines all these elements with a pervasive barrenness in the composition that haunts the viewer. Hopper never abandoned the themes that made his reputation as an artist. His art reflects the intense strains of loneliness and isolation that fueled his personal life, despite Hopper's protestations to the contrary. In Nighthawks, even Hopper admitted that "unconsciously, probably, I was painting the loneliness of a large city." Although the waxing of Abstract Expressionism in the 1950s would dampen the art world's enthusiasm for Hopper's style of realism in general, Edward Hopper has been posthumously recognized for his contributions precisely because of the timeless power of works such as Nighthawks. The painting still conjures compelling, if often bleak, fits of the imagination.